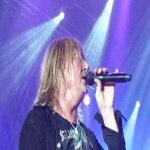 Def Leppard singer Joe Elliott was interviewed by Rock 100.5 radio yesterday and the full audio is available. Joe talked about playing the residency in Las Vegas, Vegas becoming more rock 'n' roll, the VIVA! Hysteria film in cinemas and gave an update on the possibility of a second residency in 2014 which is still to be decided. This follows on from his Planet Rock quote where he suggested it could either be 2014 or the year after before the return. Joe also mentioned a possibly return to Vegas in Sheffield on 5th September. Follow all the news so far on the second residency and 2014 tour plans in the Tour News section. "We're looking forward to doing a second residency ourselves probably next year. Yeah I think, you know the rumour mill is going and so is the manoeuvre mill if you like. All the movers and shakers that come up with these things. We will just be the happy recipient to a phone call hopefully in the next few months going Yeah - you've officially been asked back what would you like to do next?. So you know we'll just have to play that by ear and see what happens." Listen to the full 7:21 minute interview below.